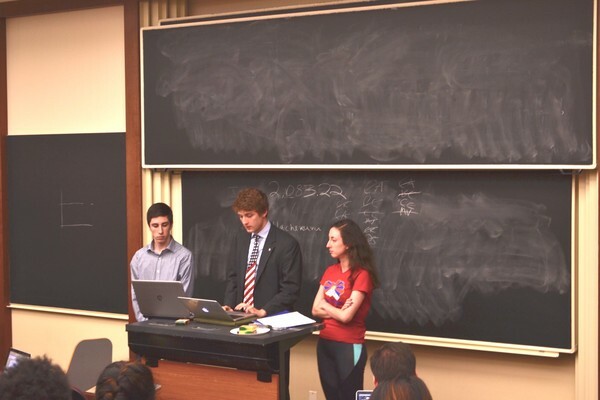 Left to right: First-year Paul Soltys, second-year Matthew Foldi and second-year Tamar Gordis give a presentation to College Council on a resolution calling on divestment from Chinese state-owned companies. College Council (CC) faced a wave of calls for transparency and consistency at its weekly meeting this Tuesday after the council passed a resolution two weeks ago calling on the University to divest from 10 companies divestment supporters named as complicit in human rights violations in Palestine. CC is now being asked by students aligned with the Coalition for Peace, which opposed the previous divestment vote, to consider two more resolutions: the first calls on the investment RSO Blue Chips to disclose its investments and divest from any companies considered complicit in human rights violations in accordance with the list of companies in the original divestment resolution passed by CC two weeks ago. The second calls on the University to divest assets from Chinese and China-associated companies based on the country’s authoritarianism and human rights abuses. Before debating about the resolutions, CC considered an amendment to its bylaws regarding transparency and recordings at CC meetings on the heels of the meeting two weeks ago where recording of any kind was banned for safety reasons. CC Chair and second-year representative Eric Holmberg said in an e-mail to The Maroon that, in accordance with guidance from the Center for Leadership and Involvement, CC prohibited recording at its April 12 meeting due to the sensitive nature of the agenda, which focused on the Israeli-Palestinian divestment resolution. At the meeting this Tuesday, third-year representative Peggy Xu and first-year representative Qudsiyyah Shariyf introduced an amendment explicitly allowing photography and the use of recording devices at meetings. However, for circumstances “in which sensitive or potentially endangering information is being presented or debated on, a two-thirds vote by [CC] members, may suspend the ability of any attendees to take photography or use video recording devices,” the amendment to Article IV, Section 8 read. Fourth-year representative Mark Sands and second-year representative Calvin Cottrell both doubted the feasibility of editing an audio recording after the meeting to remove the identity of an individual. “If something is sensitive or potentially endangering, saying, ‘Hey, record it but we can edit it later’ doesn’t seem like a great situation if it’s that sensitive or potentially endangering in the first place,” Sands said. Second-year representative Cosmo Albrecht said it should be up to CC to decide recording procedure on a case-by-case basis: “Audio recording should not be singled out… College Council should have the discretion to not have recording if it’s particularly sensitive, whether it’s audio or video,” he said. Fourth-year representative Mike Viola effectively ended the debate on that topic when he raised the question of scheduling a vote on the amendment in relation to the previous banning of recordings two weeks ago and the upcoming Student Government elections next week. “I do not think we should vote on this tonight. We should form an ad hoc committee but being asked to act on this so quickly during the election, [we are] trying to cover up tracks of controversy,” he said. Several CC members are running for reelection or election to the Executive Slate. The amendment debate was tabled until next week’s meeting, which will be after the voting for the SG election begins. Discussion next turned to resolutions about Blue Chips and divestment from China. Second-year Matthew Foldi presented the Blue Chips resolution. Foldi, second-years Paul Soltys, who is running for CC representative for the Class of 2018, and second-year Tamar Gordis then presented the China divestment reolution. Foldi and Gordis are members of the Coalition for Peace. They emphasized that these resolutions were a logical next step from the previous divestment resolution, and most of the representatives who spoke in support of their efforts opposed the original resolution. “The two things we’re going to introduce today are about consistency and letting people know what College Council voices are all about,” Foldi said. Foldi argued that the issue of Blue Chips was under CC’s domain because of its status as an RSO. “It’s totally within purview to resolve…that Blue Chips disclose who they’re investing in so we can make sure they’re not investing in companies that [CC] has deemed to be complicit in human rights violations,” he said. If they do not disclose or drop the investments, Foldi’s resolution called for revoking Blue Chips’ RSO status. In the debate following the presentation, Cottrell, who was a vocal opponent of the Israeli-Palestinian divestment vote in a previous meeting, said that any individual who supported the previous divestment resolution should support this action for the sake of consistency—especially considering that RSOs are under CC’s control more so than University investments, the target of the previous resolution. Other representatives raised the question of mentioning fossil fuel divestment in the Blue Chips resolution before the topic was tabled until next week’s meeting. In an e-mail to The Maroon, Blue Chips president and third-year Cyrus Adamiyatt declined to comment on the issue due to his lack of familiarity with the resolution. The three students also introduced a second resolution focusing on the University’s investments in and ties to China and the country’s reputation as a human rights abuser. They spoke about the Communist Party’s stronghold on public speech and the judicial system; the alleged occupation of Tibet by China and Tibetans’ resistance efforts, including self-immolation and protests; involuntary organ harvesting of prisoners in China; and the University’s recent disassociation from the Chinese government-sponsored Confucius Institute last year because of its issues with academic freedom. “Like their bodies roasting in the fire self-immolating, the Tibetans’ culture, their history, their language, and their identity is being burned right before their very eyes and [the Tibetan people] refuse to remain complicit in this,” Gordis said, describing her own interaction with the Tibetan people during a homestay program in 2014. “We too refuse to be complicit in this blatant violation of human rights…. [CC], you guys want to tackle human rights issues. Here’s another opportunity for you,” she concluded. Katherine Shen, a third-year representative, responded to their presentation “as someone who personally knows individuals persecuted by the Chinese government” by suggesting they discuss the issue with people on campus who have been personally affected by Chinese government actions. The topic was also tabled until next week, with priority for discussion over any matters other than internal Student Government affairs. In an e-mail to The Maroon, Foldi said that Gordis is working with some CC members to bring students who have been affected by the Chinese government to next week’s CC meeting.